Dr. Charles S. Beaver Jr. was born on the 7th of March, 1861, in Chatham. His father was Dr. Charles Beaver and his mother’s name was Margaret. Dr. Beaver had a younger brother named William who was born on the 16th of February, 1865 and an adopted sister named Lizzie. The family lived at 60 King Street East in Chatham. According to the 1881 census, Dr. Beaver was 20 years old and a physician. His father died in 1890, but according to the 1891 census Dr. Beaver (Jr.) was still practicing medicine in Chatham. Prior to 1895, Dr. Beaver moved to Michigan. Dr. Beaver married Mary Elizabeth Kain on the 2nd of March, 1895 in Bellaire, Antrum County, Michigan. She was born in Mecosta, Michigan on the 16th of November, 1872, the daughter of James and Maria Kain. They were divorced on the 24th of June, 1902. They did not have any children. Dr. Beaver married Vine M. Skinner on the 14th of December, 1905 in Detroit Michigan. She was born around 1885 in Kansas, USA. According to the 1910 census, Dr. and Mrs. Beaver were residing in Marcelina Twp., Michigan. 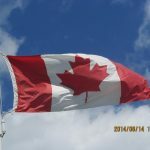 Further it lists Dr. Beaver’s profession as Physician and Surgeon in general practice. Dr. Beaver and Vine were granted a divorce on the 8th of April, 1911. Dr. Beaver was married for a third time on the 10th of October 1914, to Pearl Lambert. They were married in Grand Rapids, Michigan. Mrs. Beaver was born in January of 1891, the daughter of Samuel Lambert and the former Rachel McGuire. Their daughter Maxine was born on the 14th of September, 1915. According to the 1920 census, Dr. and Mrs. Beaver and their daughter Maxine were living in Detroit, Michigan. Dr. Beaver died on the 10th of November, 1933 in Detroit, Michigan. He was buried at Maple Leaf Cemetery in Chatham. 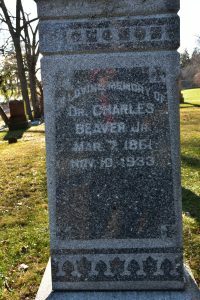 *His father, Dr. Charles Beaver also appears on the Chatham-Kent Physician Tribute website.